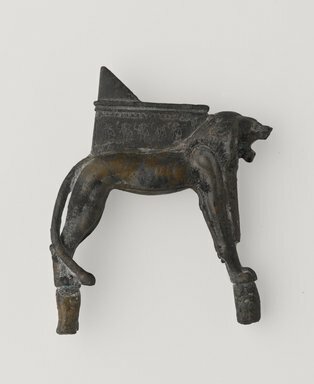 Bronze support for one side of a small throne for a statuette of a deity, in the form of a conventionalized lion, in the round, with feet resting on two dowels. On his back, a side of the throne, with incised figures of seated gods (?). Minute portion of back of throne preserved, with remains of hieroglyphic inscription. Eyes and feet of lion inlaid with gold. Condition: Excellent. Result excellent. Metal is reddish; brown and gold inlays are now apparent.